This week was all about the different types of transportation. The children learned about cars, trains, boats, airplanes, etc. 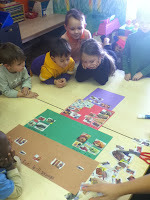 They did a variety of activities to learn what each mode of transportation looks like and how it moves. always makes it much more fun! Pretending to ride in the car that the class made together! to focus on how each one moves differently. The children really enjoyed learning about transportation- especially our boys! The letter of the week was "N". The children made "N is for Nest" as a fun craft this week! They also made Bird's Nest for their cooking project and got to enjoy these delicious treats for their afternoon snack! The Bird's Nest looked so delicious that even the teachers had to try them! The children did a great job making them. Friday was Veteran's Day so the children learned about why we celebrate Veteran's Day. They also made a neat American Flag to remind them of the importance of the holiday. To all our Veterans, "Thank you for your service!" After so many sweet treats and candy from Halloween, we decided it was a great time to talk about nutrition! Even though we all love sweets, we have to be careful not to eat too many! The children did many activities during the week with the food pyramid to discover the importance of consuming enough servings from each food group. in the correct section on the food pyramid. the 2's colored some pictures of different types of produce! This week, we also talked about staying healthy. They participated in several different exercises throughout the week. The children learned about ways they can help to not spread germs by washing their hands, covering their mouth when coughing or sneezing, etc. Making a face that can cover it's mouth when it sneezes or coughs! The letter of the week was M. The children made "M is for Mouse" and the 3's also made Mr. Moose! Our cooking activity reinforced our letter of the week with Monkey Bread. The children really enjoyed this sweet treat! Such a cute Mr. Moose! The children had so much fun learning about pumpkins, bats, spiders, etc.- maybe too much fun! Each class started out the week by exploring the inside of the pumpkin. Some of the children really enjoyed getting messy while others enjoyed decorating the pumpkin more! There were so many neat activities going on as they experimented with the pumpkin like estimating how many seeds were inside, counting the seeds, using their sense to describe the pumpkin, and even tasting the baked pumpkin seeds! Not to sure what to think about all the gooey!! Helping to paint her class pumpkin! Carefully counting all the pumpkin seeds in their pumpkin! Digging in deep to try and describe what he feels! We also made Pumpkin Muffins for the cooking project. The children mixed up all the ingredients and then poured them into the muffin pans. As you can imagine, the entire school smelled so good as they were cooking! The children really enjoyed them as their snack too! The children also did several activities to learn more about bats and spiders. The Pre-K class learned about how bats use Echolocation to find bugs to eat. They enjoyed singing to a fun song about Echolocation. They also played a game to demonstrate Echolocation by one child ("a bug")standing in one corner of the room and making a sound. The other child ("the bat") was blindfolded and had to try to find the other by just listening. To celebrate everything we learned, we had a Pumpkin Party! In the morning, the children had "Pumpkin Rotations" and moved from classroom to classroom with their teacher to do a different activity in each room. The children got to "Go Fish", do a costume fashion show, pin a face on a pumpkin, make a Q-tip skeleton, and create cute masks! Take a look at all the fun we had! Waiting to catch a "fish"! They all caught a prize! Pin a Face on the Pumpkin! They weren't sure what to think about everyone dressed up! At the end of the day, some of our parents came and brought yummy treats for us to enjoy at the Pumpkin Party! What a fun time we had! The children seemed to love every second and all the teachers were exhausted! Sounds like a successful week!